3 Masters (2 w/King, 1 w/Queen) 1 w/Pyramid Bunk, 1 w/2 Twins. Sheets & Towels Provided. 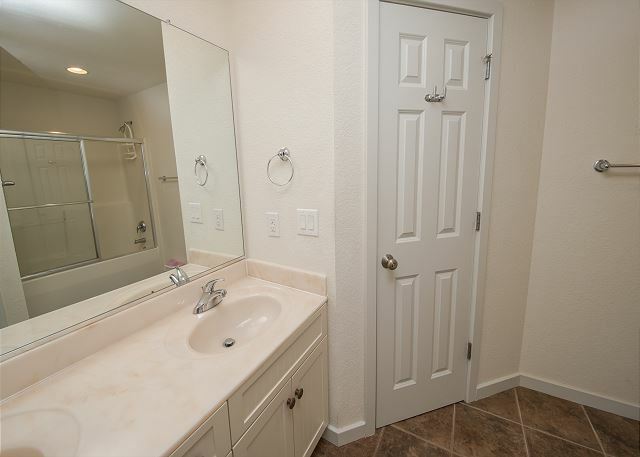 Ace's Delight is stocked with all the amenities to make your vacation a pure delight. Plus bring along your furry friends. 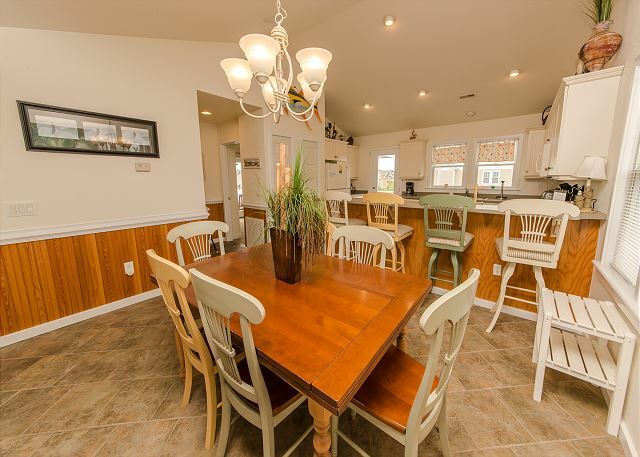 Prime location to restaurants, shopping and family attractions. Minutes from Roanoke Island which features The Lost Colony Outdoor drama, Maritime Museum, North Carolina Aquarium, Roanoke Island Festival Park and so much more. Not to forget, Jockey's Ridge National Park is within walking distance. Low traffic area safe for jogging, walking or bike riding. 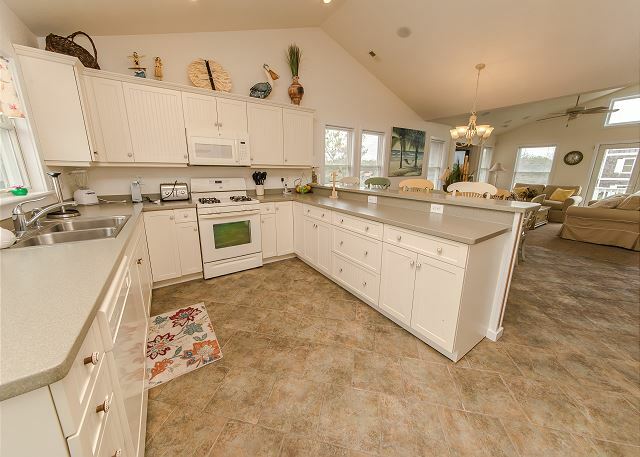 Everything you could ever imagine is at your fingertips in this home, including the Ocean. Walk to the beach is under 1 minute depending on your walking speed. Next door to house 1111, Mi Casa Su Casa. 8 CATVs, 4 DVDs, Pool size is 14x25. 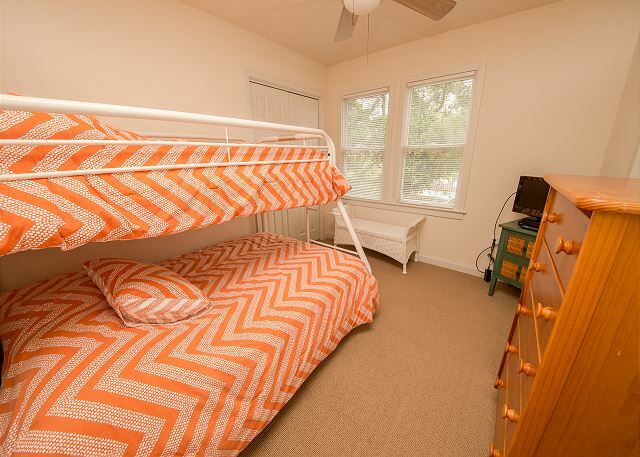 Other amenities include beach chairs, baby gate, outside sound system, pool games, extensive poolside and deck furniture, picnic table, clock radios in each bedroom, baby stroller, boogie boards, rec room with refrigerator, ice maker, bicycles, outdoor horseshoe game, captain's watch, gaming console, panoramic ocean views, DVDs/Books, beach wagon, sand toys, and charcoal park grill. 185 yards to the ocean. 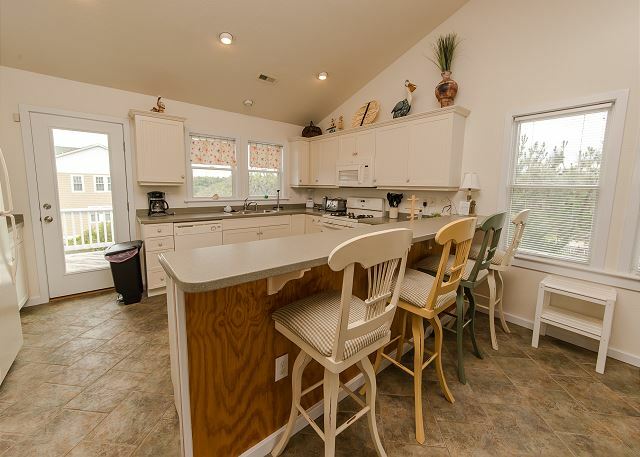 Ground Level: Carport, Charcoal Grill, Horseshoe Pit, Basketball Goal, Golf Game, Tiki Bar, Pool Games, Pool Floats, Pool Area Lounge Furniture, Hot Tub, Pool Table, High Top Tables, Full Bathroom, Mini Kitchen w/Ice Maker, Full Size Fridge, TV, Stereo System w/CD Player and Poolside Speakers. 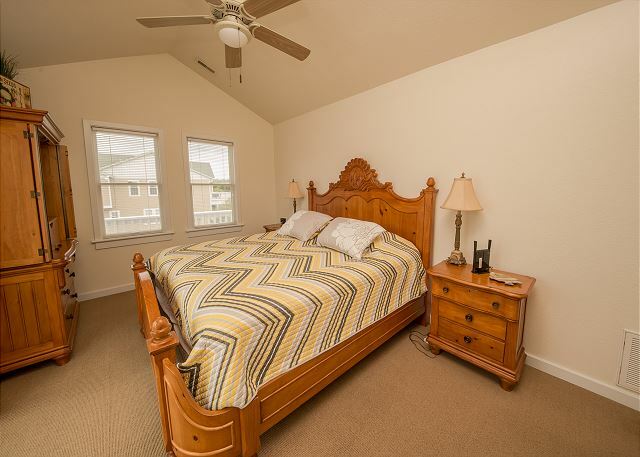 Mid Level: Bedroom w/2 Twins w/TV, Shared Bathroom, Bedroom w/Pyramid Bunk w/TV/DVD, Master Queen Bedroom w/TV, Master King Size Bedroom w/TV/Laundry Closet, Master Bedrooms face ocean w/Decking. 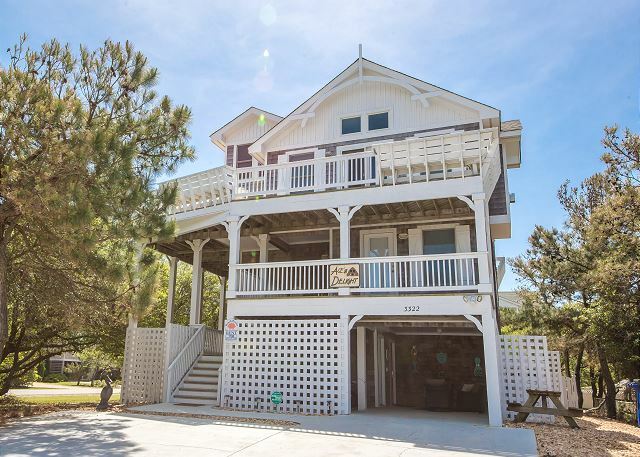 Upper Level: Captain's Watch, Gas Fireplace, TV/Stereo/DVD/CD Player, 6 Person Dining Table, 4 Person Bar Seating, Half Bathroom, Kitchen, Porch, Sun Decks Facing Ocean, Master King Size Bedroom w/TV/DVD, Master Bedroom faces ocean. 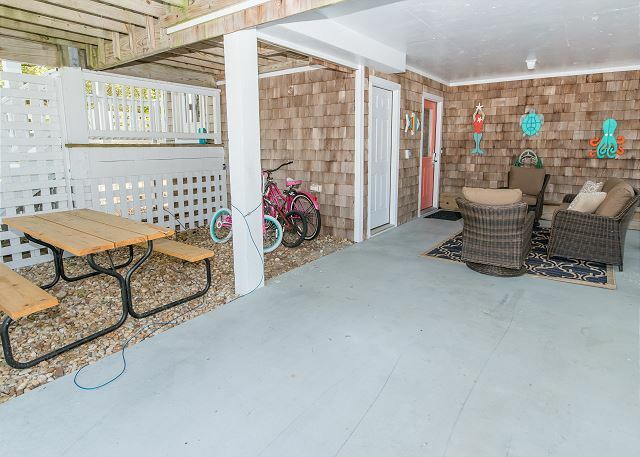 Beautiful, well maintained beach property. 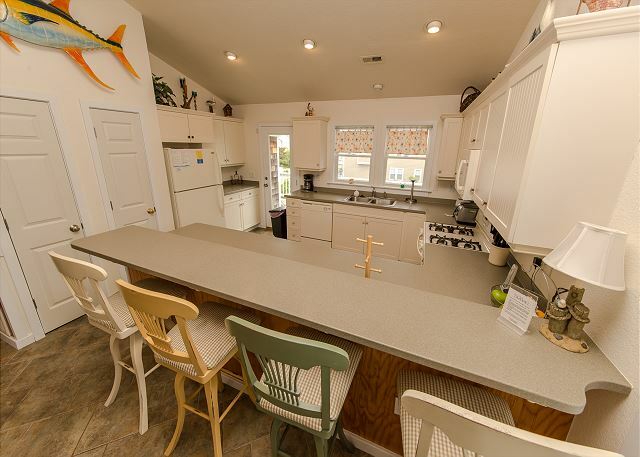 Kitchen was very well appointed for family cooking. Lot's of toys, games and beach gear provided. Nice pool with security buzzer. This is at least our 3rd year here. Not far from beach, and road is not heavily traveled. Waling distance to kids park. This was our 7th consecutive year staying in Ace's Delight. It's a great beach house. Sadly, we will be switching beach houses next year because the owner decided to switch to Saturday check in from Sunday, which we prefer. 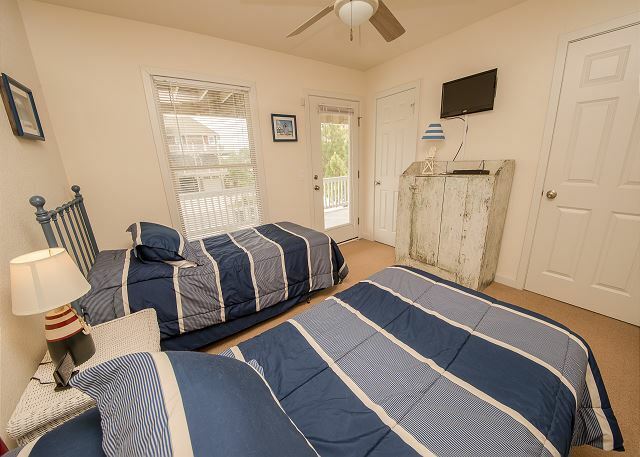 I would highly recommend this beach house however, as it has it all - Central AC, internet, a swimming pool, hot tub, pool table, etc. 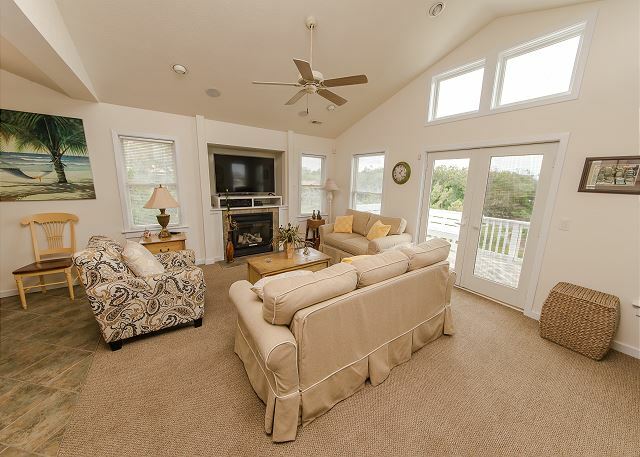 Great location too - close to Nags Head Fishing Pier & Lucky 12 Tavern. We will miss you Ace's! Patricia, thank you for sharing your story with us! We are glad you love this house! Please let us know if we can help you in any way for your vacation in 2018! 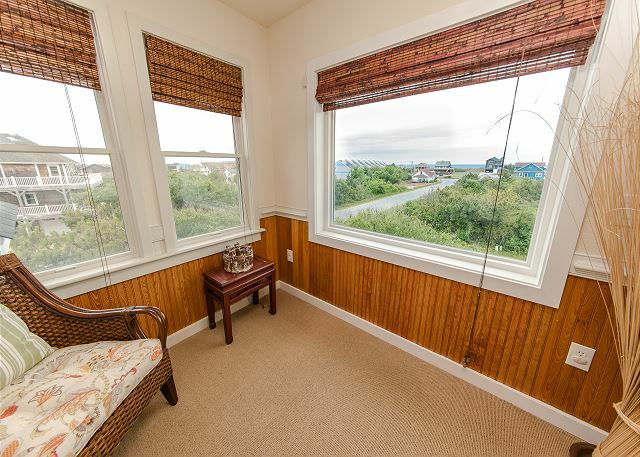 Beautiful house on large, double lot on corner facing undeveloped land toward ocean. 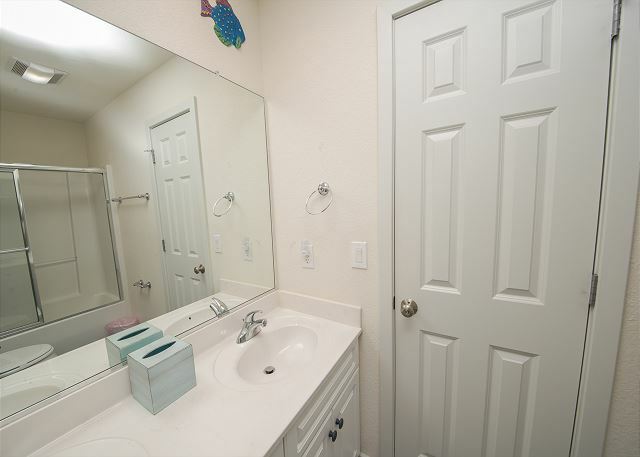 Many amenities and near beach. Dog friendly, couldn't ask for more. Christine, thank you for sharing your feedback with us! We hope to see you again soon! This house was perfect for our stay. 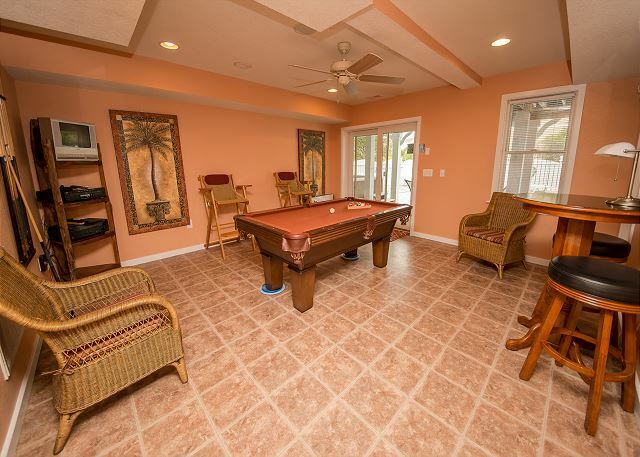 The pool table and pool came in great for late evenings and rainy days. The house was equipped with anything you would need and more. It was very clean and very comfortable. Located on a corner , surrounded by trees , made it very private. Stacie, thank you for sharing your experience with us! We are so glad you had a great stay, and that you enjoyed the property. The owner will be thrilled to hear it! We hope to see you again soon! 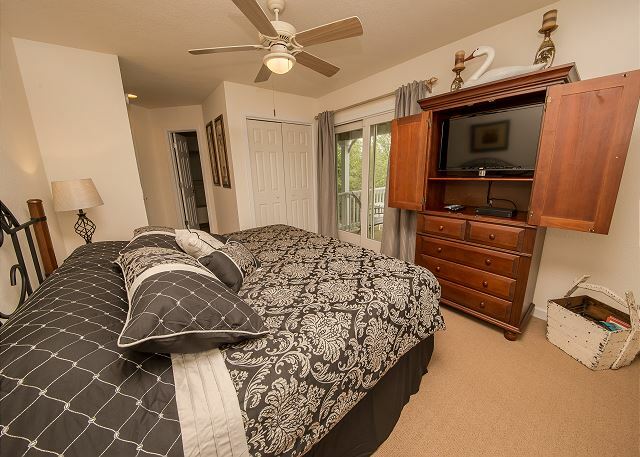 Aces delight is a beautiful spacious home with plenty of bedrooms and showers! 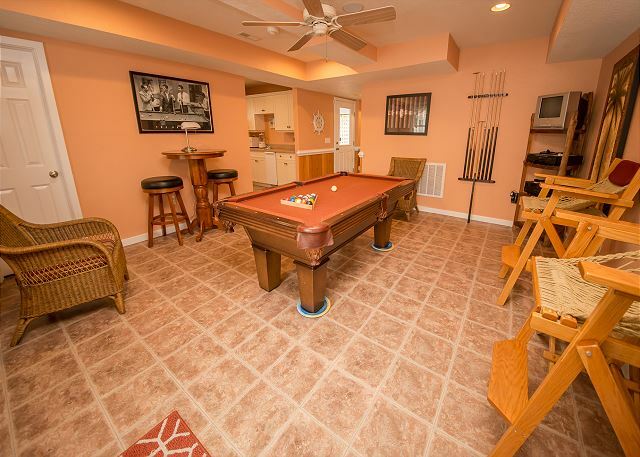 Love the pool table and game room that even has a mini kitchen with a large refrigerator! The hot tub was my favorite as well as the beautiful pool and outside shower! The house is so very nice and on rain days we watched the movies that are there. Lots of good ones! The beds were so comfortable and lots of deck space for reading and relaxing. Laura, we are so glad that you enjoyed your vacation! Thank you for sharing with us! We hope to see you again soon! My family has stayed at Aces's Delight for the last three years and intend to stay again next year. We appreciate your loyal business throughout the years and cant wait to see you next year! Ace's Delight a real delight! 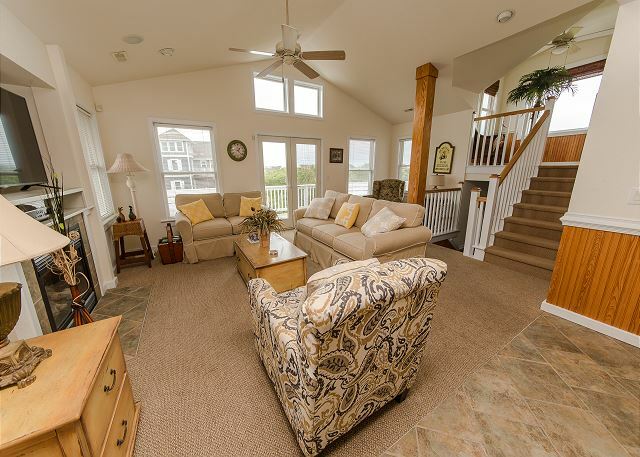 We love this beach house and this was the 6th year in a row we've stayed there. We shall return next year! 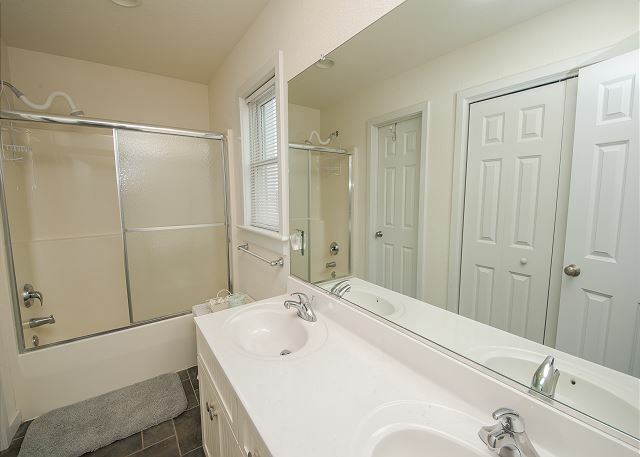 The house was spacious and in very good condition. Pool was great, just wish it had a gas grill since the grates are easier to keep clean. Our family truly enjoyed Ace's Delight. The property had everything a guest might need and then some. 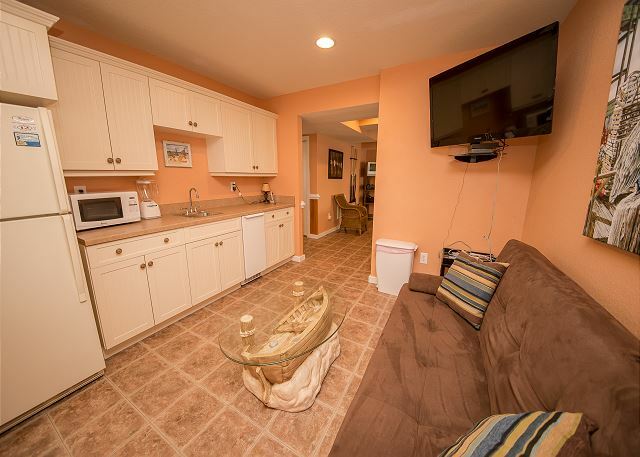 The location was ideal because of the proximity to the beach and nearby shopping. The house itself had a great layout, large family gathering area, open kitchen and an awesome ground floor that led out to a large pool area. We made use of the grill, outside seating areas, various decks and beach chairs/equipment. We loved it and hope we can return next year. 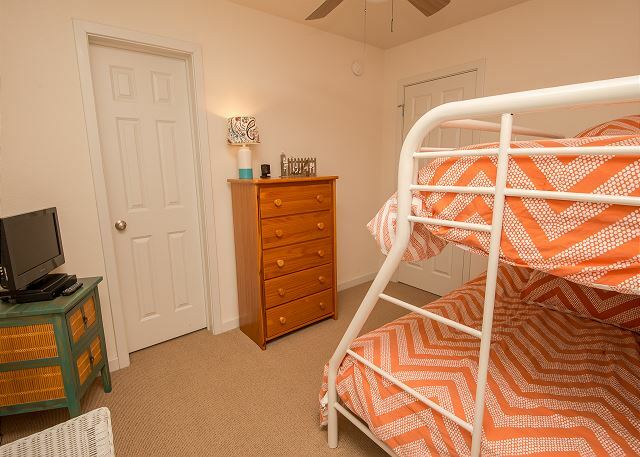 This was my fourth year staying at Ace's Delight while vacationing in Nags Head. Look forward to returning next year. 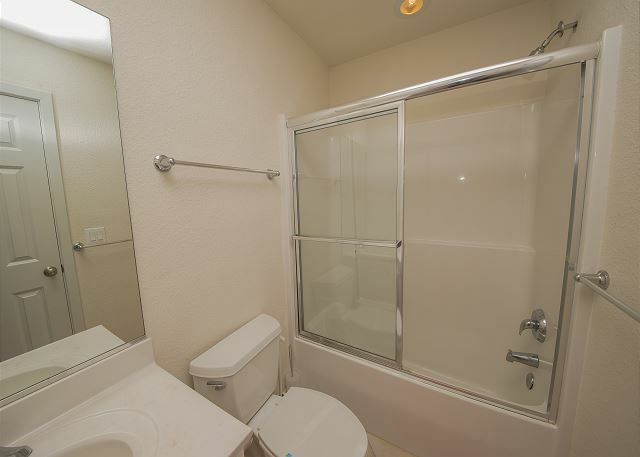 One of the things that make this house so great is the amount of privacy you have here. The house is located on a huge corner lot and there are vacant lots right across the street. It is nice to sit on the deck without having conversations with your neighbors. Ace's Delight a real gem! We love this house and have stayed in it the past 5 years. 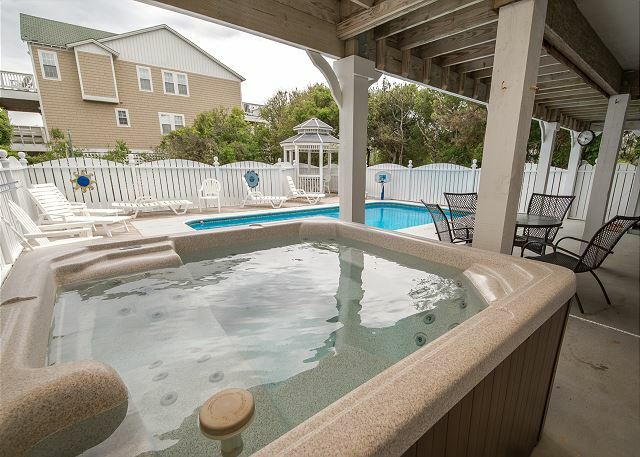 It has a wrap around deck, 5 BR, 5 1/2 BA, a pool, hot tub, etc. One block from the beach. It's a great house! Family Vacation for first time in 11 years. The house was perfect for what we were expecting. Clean, convenient to beach, AWESOME pool.. We spent much of our time in and around the pool. There was a problem with the upper level A/C but the issue was fixed timely. Janet at the rental company was VERY helpful in getting that issue resolved. All of us wished we could have stayed another week. A good testimonial to a great family vacation. An issue with the foyer kept us from using the front door, but as it turned out it never was an inconvenience. New beach chairs, and plenty of pool floats etc. We enjoyed everything that was offered with the rental. We had a slight problem and within a couple hours of reporting the problem it was taken care of . Couldn't be happier. It was very well equipped. There were plenty of pool floats,beach chairs and more kitchen equipment than I have in my own home! The beds were very comfortable. My only negative would be that the TV and DVD were very difficult to operate. I found Ace's Delight online and thought it would fit our family perfectly. My husband and I are in our late 20's, we have a toddler, a baby, and a labrador. With us, we have my parents, my brother and his girlfriend, and an extra bedroom for friends who cam throughout the week. The house was perfect for us and was absolutely comfortable. 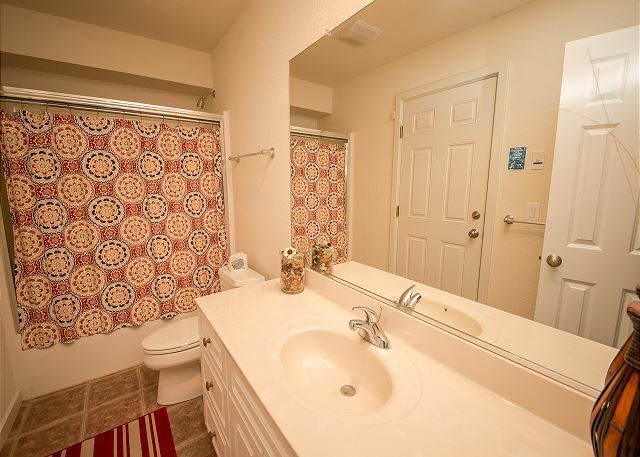 The furnishings are up to date (even newer than the photos online), the size is huge, the number of bathrooms was so convenient, and of course the pool was a big hit. The beach access was so close and helpful, but on the days that we didn't feel like packing up everything you need for a beach trip with a toddler and baby, we had fun in the pool. 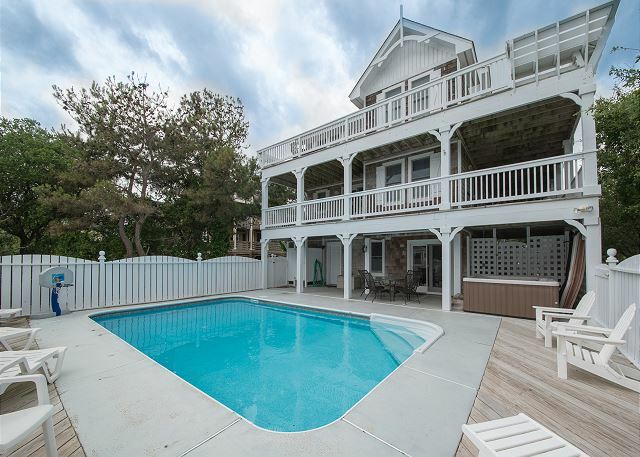 We visit the OBX from Northern Virginia every summer, and I think that we've found the house that we'll come to year after year. 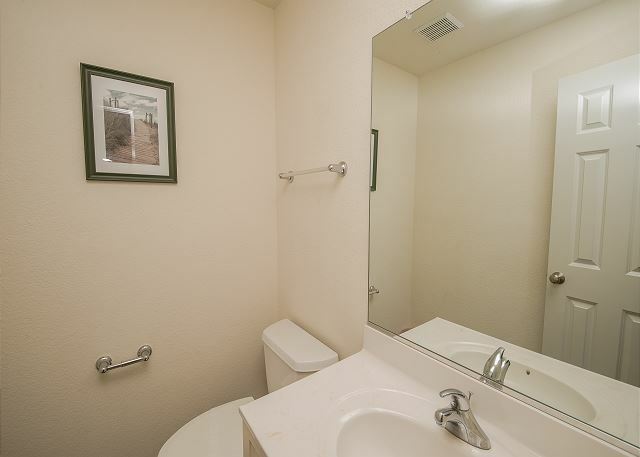 Had so many amenities we couldn't use them all. We had 5 adults, 19 yr old, 18 yr old, 15 yr old, 13 yr old, and a 6 yr old. The pool and pool toys were great. The bicycles were a favorite with all the kids!!!! They loved the extra mobility they provided. The neighborhood was wonderful. We really had to search hard for any negatives. The television system was full of features but a little complicated for casual users. Parking was great for 3 cars and still room for the kids to play basketball. 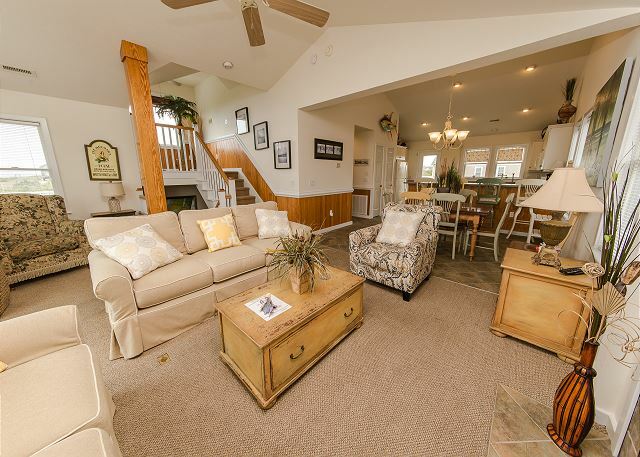 This home has everything you need for a wonderful vacation. Would definitely stay in this home again. Highly recommend! Wi-Fi does not work in the pool area.